One of the key works of International Gothic in Catalonia is the Marian altarpiece from the monastery of Santes Creus. The Museum keeps the Nativity, crowned by the figure of Saint John the Evangelist, and the Resurrection of Christ, while the rest of the panels are kept in one of the chapels in Tarragona cathedral. 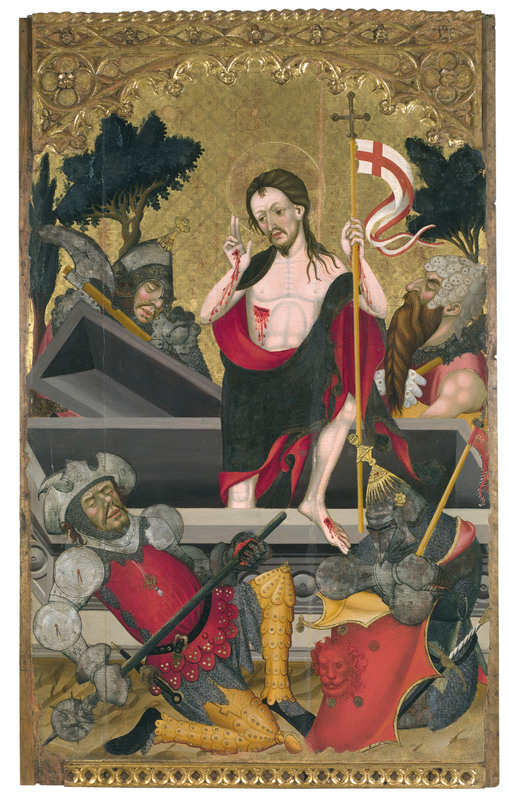 The altarpiece was commissioned from Pere Serra but it seems he died before he could start painting it. Guerau Gener, a painter skilled in Valencian International Gothic, took his place, but following his early death the work was completed by Lluís Borrassà, one of the central figures in early Catalan International Gothic painting. Side compartment of the altarpiece of the Virgin. The Museu Nacional also keeps a panel of the Nativity and a top panel with Saint John the Evangelist. Most of the panels from this altarpiece are kept in a factitious arrangement in Tarragona cathedral. They come from the high altar of the church of Santa Maria in the monastery of Santes Creus (Alt Camp).